This applies to all zones on the map. How much of a concern do you think the following issues will be in Arborfield Village once the Arborfield Relief Road has been built? This applies to Zone 1 on the map. How important do you think the following improvements are for the Arborfield Cross roundabout once the Arborfield Relief Road is built? This applies to zones 2 to 6 on the map. 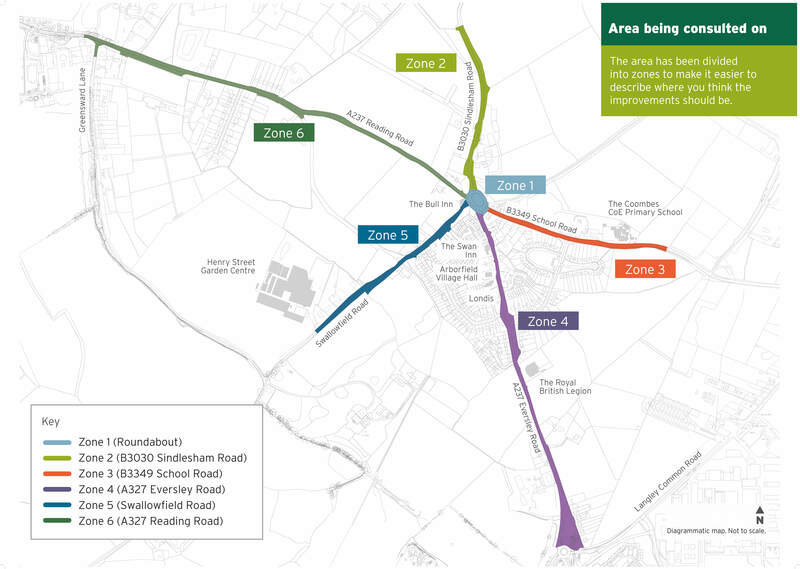 How important do you think the following improvements are for the road network running through the village? This applies to all zones on the map. How important do you think the following improvements are for creating a better public space? What are your top 5 priorities for improving Arborfield Village? Please give up to 5 preferred improvements. If they are specific to a particular location, you can use the zones on the map to help describe where you think the improvements should be located. To help us with our analysis, we would appreciate it if you could provide us with some further information about you. While this is not mandatory, it helps us understand how representative the data is of the Wokingham Borough community. The information you provide on this form will be used to process your response to the Arborfield Village Improvements public consultation. The legal basis for processing this data is that it is necessary for the performance of a task carried out in the public interest. The data will be analysed on our behalf by our contractors WSP and its sub-contactors but will be processed in accordance with the 2018 Data Protection Act, the General Data Protection Regulations, and any subsequent data protection legislation. Further information about the processing of your data can be found on our website at www.wokingham.gov.uk and search ‘privacy statement’. Thank you for taking part in our survey. Don't forget to click 'submit'.